Although jobs in information and communication technology are among the fastest growing worldwide, the growth of graduate women in computer science has stagnated since the 1980's, with fewer women equipped with the coding skills needed to tell more stories in the world of digital journalism. However, new project, Coding Like A Girl, has aimed to encourage the growth of females in the space, by taking a deeper look into how different countries are getting women into coding, along with the obstacles these women have to overcome to achieve their goals. Journalists Michele Bertelli, Javier Sauras, Felix Lill and Abdi Latif Dahir teamed up to interview programme leaders in Peru, Tanzania, and Germany about their work, and the impact that closing the gender gap in the IT workforce is having on local development in each area. "We wanted to focus on a mix of characters, showing the differences between developing countries and those in the western world," Bertelli said. "Many scholars agree that women got disenchanted with technology in the 80's, when computing was marketed towards men. "It was evident from this project the need for role models in this space – you don't get to be what you don't see." Visual impact for the team was absolutely essential, Bertelli explained, so they used video with text, photography, motion graphics and illustrations to convey a complicated topic in a simple way. The project, which was funded by the Innovation in Development Reporting Grant Programme from the European Journalism Centre, was published on Al Jazeera as an 80's-style video game that users go through, level by level. 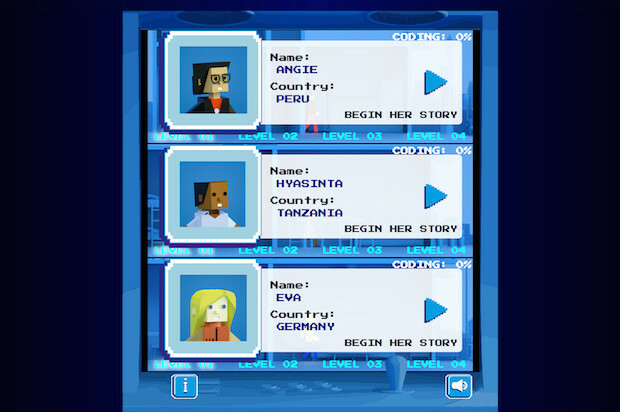 The viewer gets to choose which 'character' they follow, female coders Angie, Hyasinta and Eva, and watch a short video package, followed by a quiz question based on what they had just seen. "Our initial version was a lot more simple, with basically an interactive video story with the appearance of a video game," he said. "Now, the audience travels along the journey of the protagonist – it is much more like they are actually playing along. "The quizzes are there to give the audience motivation to keep going, as they are fun, but also teach them more about the subject – we had to find the right balance between giving the audience questions that they would be able to answer, while ensuring they were challenging enough that they had to pay attention." The project also went on to be published on Der Spiegel in Germany, Quartz in the USA and El Confidential in Spain. Is your news organisation encouraging more people to learn coding skills? Get in touch @journalismnews.